A baby boy in southwest China is in intensive care after being assaulted by a 10-year-old girl, who claims he then fell from the 25th floor of an apartment building. Baby Yuanyuan Li (alias) was in a coma for eight days after the incident. His injuries include severe brain trauma and a punctured lung, according to the Sky Post. His surgery is postponed to this weekend or early next week due to his health condition, according to official media Beijing Times. The incident took place on Nov. 25, when Yuanyuan and his grandmother were exiting the building elevator as the girl was coming home from primary school. The grandmother took out the stroller, but the doors closed before she could bring out Yuanyuan, leaving him inside with the girl. Footage from the surveillance camera showed the girl picked up Yuanyuan and then threw him down, kicking him several times before she threw him out of the elevator and took him to her apartment on the 25th floor. In her police confession, the girl said she put Yuanyuan on the balcony guardrail to “play with him,” and he then fell to the ground. The girl’s motives for the attack are unclear, but police will not press charges due to her young age. Her father said when he questioned her about it, the girl said that the toddler had made faces at her and been unfriendly, according to Qianzhan.com. The family has reportedly taken the girl to northwest China to protect her identity. 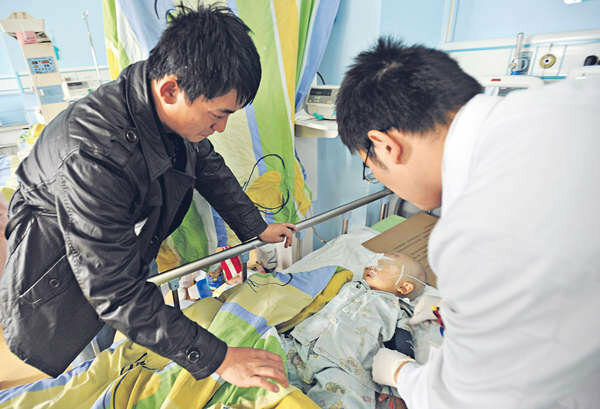 Yuanyuan’s parents have filed a civil action suit demanding 300,000 yuan (nearly $50,000) in compensation, and have received some money from the girl’s family towards medical bills. The story drew a lot of attention online, and a blogger released the names and addresses of the girl, her parents, and grandfather.